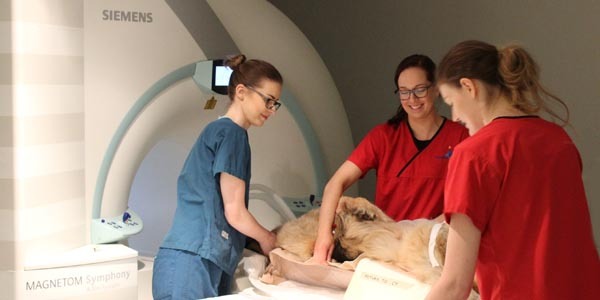 To mark World Radiography Day on 8th November, our imaging team have taken part in a Q&A about their chosen career, the differences between human and veterinary healthcare and what life is like working at Fitzpatrick Referrals. 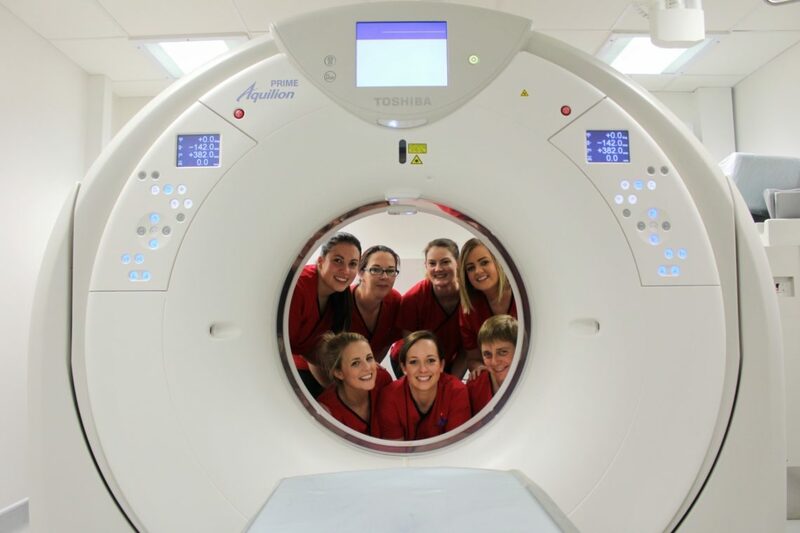 What made you decide to become a radiographer? Sally: I used to be a veterinary nurse and loved being involved in the imaging side of the job, so I decided to retrain and become a radiographer. Sophie: In 2004 I saw a recruitment campaign for the NHS on the television, which showed a man falling down a flight of stairs after suffering an epileptic seizure. The advert listed all of the staff involved in his care, one of which being a radiographer. This inspired me to look further into healthcare professions, and I was particularly attracted to radiography as it involves caring for patients as well as working with state of the art technology, which I find really interesting. Johanna: My aunt convinced me – she is a radiographer and took me in with her during an on call to see the role of a radiographer and I was hooked after meeting a really keen radiologist who showed me really graphic trauma scans! Tell us the journey of how you got to where you are now. Sharyn: In my early twenties I did a locum job at the vet school in New Zealand (NZ) which I loved, surrounded by domestic, farm and NZ wildlife animals – I was in heaven! I went to the UK; worked back in NZ in my nuclear medicine speciality; worked back in the UK; back to NZ where I finally got the ultimate job of working at the vet school and in nuclear medicine, a great mix of human and animal work. This year I moved back to the UK and found locum work at Fitzpatrick Referrals, ending in a permanent part-time position back with my love of animals doing x-ray and CT.
Johanna: I have been very lucky – as soon as I qualified I wished to travel and as this degree is so highly demanded all over the UK, I found myself packing up my car and moving to north Wales for my first job. Following a three year stint in north Wales I wished to specialise in MRI and worked in a major trauma centre, making my second big move up to Manchester. After spending close to three years in Manchester I finally had the opportunity to apply for my dream job working in the veterinary field, hence my current location down south in Surrey. Radiography has enabled me to work all over the country and I have been very lucky to work in all these different places, making so many friends along the way. Jo: I studied radiography at Cardiff University and then got my first job at a local Surrey hospital as a rotational radiographer. A year later I joined a different hospital to work as an interventional radiographer with a general rotation. I heard about the job at Fitzpatricks and loved the idea of combining my love for animals with a job I really enjoyed, so I applied and here I am! Felicity: I qualified from the University of Exeter in 2007 and decided to move home to Surrey, closer to my family. I got my first band 5 job at the Royal Surrey County Hospital and whilst there learnt both CT and MRI, which really initiated my interest in cross-sectional imaging. A good friend, who already worked at Fitzpatricks, invited me to come and spend a day with the imaging team which I loved and so when a job came up I knew it was the place I wanted to be. L-R: Felicity Stringer, Sally Morgan, Joanne Lloyd, Claire McKevitt, Johanna Slavin, Sophie Meads and Sharyn Bray. 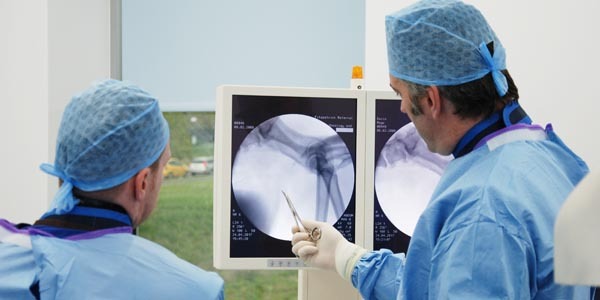 What attracted you to work in veterinary radiography? Claire: As an animal lover, it has always been a dream to work with them so when the opportunity came to couple my professional career with animals it was ideal. Felicity: I remember going on a CPD course and one of the topics was veterinary radiography – it was so interesting and was really something I aspired to do in my radiography career. 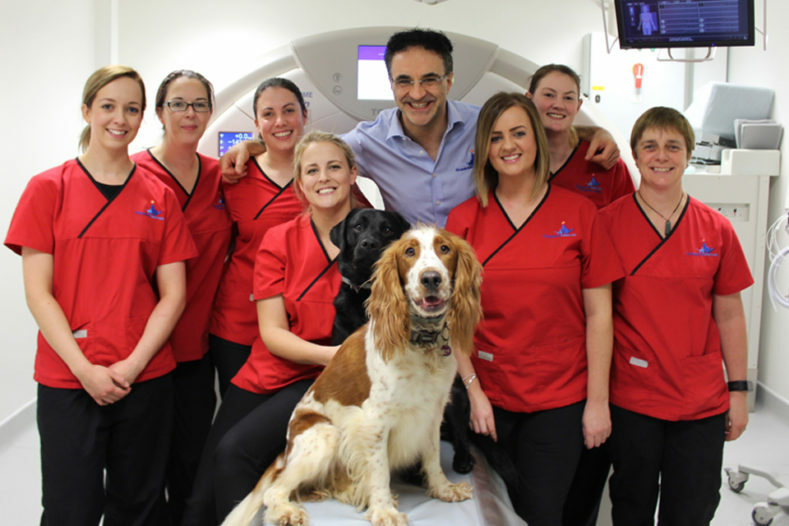 Having practised human radiography for eight years, I felt that the time was right for me to explore the world of veterinary imaging and I’ve never looked back! Sally: I feel like my career has done a full circle, veterinary nurse to radiographer to veterinary radiographer!! 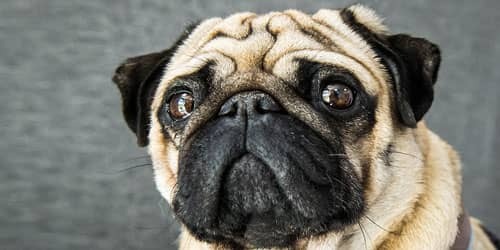 How different is human healthcare to veterinary healthcare? Johanna: Working at Fitzpatrick Referrals has enabled me to see many pioneering surgeries that are performed nowhere else in the world and many that have not even been implemented into human medicine. Human healthcare will always be the bread and butter for me but to be able to cuddle my patients and help man’s best friend is the best of both worlds. Sharyn: We essentially do the same job, our patients just have four legs and more fur and slobber! Though that sounds like a Saturday night in ED too!! Claire: In theory, veterinary radiography is very similar to human radiography, but in reality, it is completely different! For example, our patients aren’t able to follow instructions – we work closely with the nursing team and with their assistance we achieve optimal scanning conditions, such as breath holding and positioning. Jo: Being involved in making a difference to an animal’s life and having the opportunity to learn new things and skills every day. Sally: Not knowing what is in store for you when you start in the morning. Having a fabulous, supportive, enthusiastic forward thinking team to work with and of course, our patients are just gorgeous. 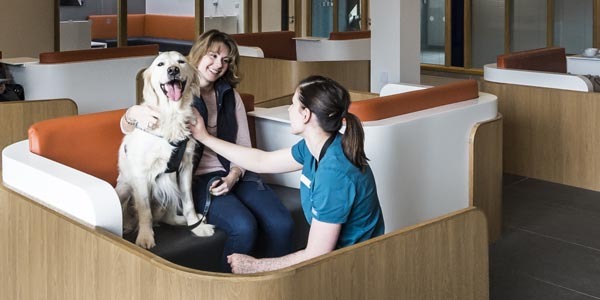 Sophie: Seeing the success stories of patients I have helped care for – doing post-operative scans and seeing that the operation has been a success and seeing patients make a full recovery and be discharged with waggy tails back to their families – it is so rewarding. Felicity: I love the challenge that veterinary imaging presents and applying my skills and experience from human imaging to my animal patients in order to achieve that perfect image. Claire: As a referral practice our patients can be in a lot of pain and very sick, which can be difficult to witness and sometimes they cannot be helped. Although it can be hard, decisions are always made with the patient in mind and whatever is best for them and their quality of life. Sophie: I hate seeing animals in pain or suffering, so the thing I like least is when we get trauma emergencies into the practice where animals have been injured by vehicles on the road or by other animals. The animals are so helpless and it is really sad to see. Sharyn: Sometimes we find out that our patients have a really bad disease and we won’t see them again. 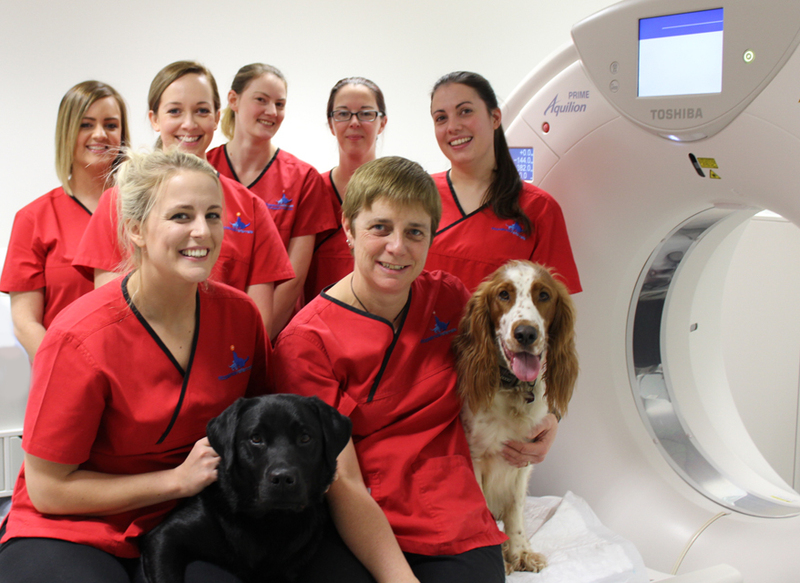 The imaging team with Black Labrador Manu and Welsh Springer Spaniel Kian in the CT scanner room at Fitzpatrick Referrals. Jo: Being involved with work that is at the forefront of veterinary medicine and working with such a great team! Sally: Working with such an amazing, professional, passionate group of people who are all in this job to make the lives of animals happier, healthier and longer. Sophie: I feel privileged to have the opportunity to work in such a fantastic, passionate and dedicated team, with each individual bringing a vast range of skills from different backgrounds, which allows us to provide an outstanding service to our patients. I feel really proud to be part of the Fitz family! Find out more about our Advanced Diagnostic Imaging Service.